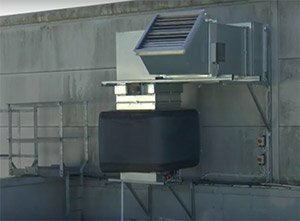 The combined cooling system uses evaporative coolers as part of an air handling solution, providing energy efficient cooling and heating to buildings. 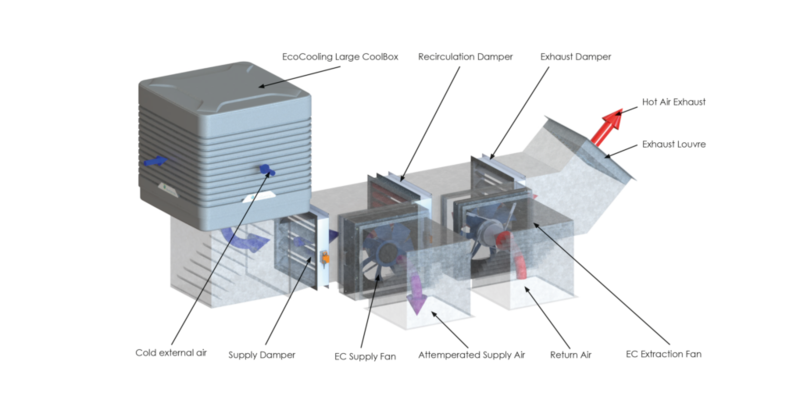 The system is designed to manage both the oxygen levels and temperature of the room while minimising energy use, environmental impact and noise. This system complies with local regulations and can replace existing systems to reduce carbon footprint and help achieve energy reduction targets. Why use evaporative cooling in gyms? Gyms, like all buildings needed to be kept cool in hot weather, warm in cold weather and ventilated correctly to prevent the buildup of CO2. In normal conditions where CO2 levels are not measured, building regulation guidelines state that there must be 10 litres per second of air per person entering the building. This equates to over 1000 litres per second in a gym which can cater for 100 people. At a required design temperature of 20°C inside when the outside temperature is 0°C, it takes 2kW of central heating to heat the air that is coming in, to get it to the correct temperature. The evaporative cooling system minimises the heating energy by measuring the CO2 in the building at all times, bringing in the air only when the CO2 levels rise over 1000ppm. This avoids unnecessary heating. External air is heated using a radiator system at the point of entry inside the gym and this air is then recirculated to keep the chill off the building when there are only a few occupants. One of the main advantages is the fact fresh air is being used in the cooling system, reducing recirculation improves the internal air quality and reduces smells. This system complies with local regulations and can replace existing systems to reduce carbon footprint.